One of the most common pet-peeves of our practicing sisters wearing a hijab is to maintain it all up there throughout the day. And the problem becomes more instrumental in the case of our new sisters trying the HIjab. Keeping it firm on the head all day long seems a herculean task enough for the newbies and might spell out the same for the veterans too if they haven’t mastered the art of maintaining firm hijabs with their tricks and twitches. A firm hijab is also essential to maintain the many scarf –styles (read many-folds voluminous hijab, hoody hijab, side hijab,) to cast a modest picture of your personal style. So what do we know and have what have we learnt so far? The problem and here comes the solution. 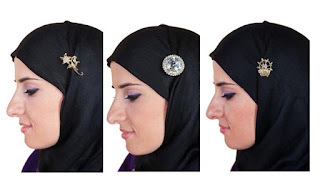 The answer ladies is Hijab pins. These hijab pins are not your regular metallic pins more in sync with surgical boxes but ornamental broaches. Except for the usage the appearance differs from the regular ones to add to your look. Let me brief you that Hijab pins not only accentuates your scarf by doubling as an accessory but also fastens it firm to the under scarf or scarf itself maintaining your folds and layers tucked in and neat. The market is replete with myriad choices and one can go bonkers over some. A piece of advice - while fishing out ‘your’ hijab pins make sure that you also select it for its utility as some are just ornamental without feasibility of being used as good pins. So now that we covered it, let me make your life easier by offering our line on the same. Introducing EE’s fresh take on Hijab pins. KOSHBO PIN- This ornamental rose pin carries a gold base with two stones. The studs make sure that the roving eyes set at the right spot. An ideal wear on something floral. FLOWER BASKET PIN- This exquisite piece is a little treasure in its own right. Notice the tiny leaf like structures adding more dimensions to the broach. A total must have. DIAMOND PIN- This disk shaped pin comes with a large stone at the centre surrounded with mini-crystals to finish off the elegant look. A handy advice when using these pins: try and go for a monotone hijab to make the pin prominent enough!